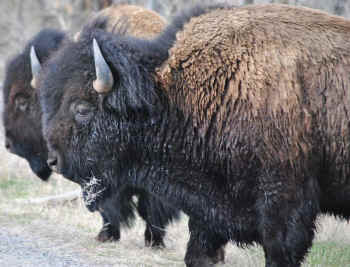 HB 194 is another attempt by special interests to block the resoration of wild bison in Montana. This act must not become law. Contact Montana Governor Steve Bullock and let him know you stand for recovering America's wild buffalo. If you live out of state, let him know why you visit Montana and what is important to you. Tell him to veto HB 194. HB 194 is an act requiring a forage (range) analysis before wild buffalo (or bison) are released, transplanted, or migrate naturally, onto land in Montana. HB 194 is another unfunded mandate required to be performed before transplanting or reintroducing buffalo as a wildlife species in Montana. HB 194 provides no funding for a required forage analysis by a range scientist from MSU-Ag or US NRCS. HB 194 uses agricultural theories based on livestock grazing principles rather than professional ecological analysis by wildlife and wildlands professionals. A recent study done in Utah's Henrys Mountains clearly demonstrates that domestic cattle and bison use the landscape differently. Read Jackrabbits are a bigger problem for cattle than bison in Utah’s Henry Mountains, USU study says.